Written at 08:17:31 on Saturday, 9th December, 2017. Rarely does the subject of whether a radio is the real thing or not come up because most of Australia's experienced collectors can tell either way from a great distance. The subject of the place replica radios have in the overall scheme of things, I feel, does require a discussion. Whether we like the idea or not, replica radios are a fact of life and are present in great numbers. Some, okay, most are mass-produced in China and other Asian nations, contain not only AM and FM reception but also either a compact cassette deck or compact disc player, with the slot for these usually on one of the sides. I am sure that the slot for the playing medium is on the side as an effort by the manufacturers to make these radios look as realistic as possible. I even saw a replica tablegram the other day and it has a turntable for 33.3 and 45 RPM records! Is vinyl making a comeback? 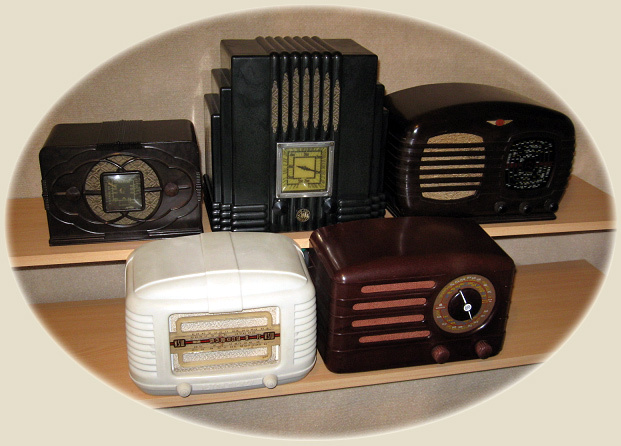 Such radios as just described are usually made in the wood-veneer tombstone cathedral style popular with some manufacturers between 1929 and 1933. As far as Australian manufacturers go, AWA and Airzone made several models. Ironically, the replicas made today really do not do justice to the time, effort and quality of the receivers made by AWA and Airzone or even imported models made by Atwater Kent and Philco. These replicas don't even match the looks of any of the genuine articles nor do they sound as good with their scrawny speakers, compared to the 150mm monsters found in the real thing. Are there any realistic replica radios? Some reasonable attempts have been made to reproduce models such as the Tasma Baby and the AWA Radiolette, both made around 1947. Whilst the styling of these two models to go some way to matching the 61 year old receivers they imitate, sadly there are still too many characteristic flaws in both dimensions and colours to consider either worthy contenders. The replica Radiolette even runs on valves but they are baseless valves rather than octals, although this is considering the production of most octal valves ceased 50 years ago. One recent attempt by a collector to reproduce the more famous AWA 'Empire State' Radiolettes of the mid 1930s deserves a noteworthy mention. This is because this person makes the cabinets out of a material that so closely resembles Bakelite. He then fits genuine AWA chassis' to them. These receivers, despite being available in colours that AWA did, and did not, make are so close to a real Radiolette in dimensions, looks, style and quality that you could put one side by side with the real thing and you'd have to look very closely at both to choose the one made 73 years ago. Is such meticulous attention to detail a good thing? In many ways it is. Firstly, finding genuine Radiolettes is not easy and when you do happen by one the price, assuming it is for sale, is often out of reach for most people. The commonly-made brown 1935 Radiolette can fetch $1,500 easily if the set is complete and in good condition. Black ones are more expensive at around $2,000. Marbled white can earn the owner $8,000 and jade green can fetch $15,000. There is one mottled green set with black and white spots known to exist and rumours have it that the lucky owner has knocked back offers of more than $20,000 for it. Other rumours dictate that there are a few fire engine red and royal blue examples floating around in South Australia. I cannot confirm the validity of this though but if these colours do exist for a real Radiolette then they can safely be considered out of reach for 99.999% of collectors world-wide. The fact is that a 1930s Radiolette in any colour is one of the most coveted radio receivers anywhere but it remains that you would need a second mortgage or a Lotto win to bribe the owner to part with his booty. A quality replica, especially if it uses a genuine chassis, will give people who do not have the resources to find or finance a genuine receiver to own a piece of unique Australiana. I don't see anything wrong with this as it spreads the appreciation that people have for valve radios. There is one downside though. One day, such exacting replicas may bring out the dishonesty in some people. Collectors who are not experienced could easily be fed lies about the authenticity of a receiver by someone willing to pass off a replica as genuine and this is definitely not a good thing. This is something that the vintage radio fraternity is going to have to come to terms with in the years to come and because replica radios are here to stay, we will have to adjust and accept their place and in doing so, learn how to detect quality replicas apart from genuine receivers. One aspect can at times make life easier for experienced collectors - replicas are often made in colours not available when the genuine article was manufactured. The real thing - The five receivers pictured above were made back in the golden days of radio broadcasting. The are genuine chassis' in genuine cabinets. Some replicas come close but none will ever come close enough. All these models have been replicated by various people in the last few years. I am one collector who does not really have an interest in replicas. I would like to make sure all my receivers are those made in the golden days of radio, where each set I put on display has a story to tell. Many of the receivers in my collection would have uttered the words of Sir Robert Menzies when Australia declared war on Germany in September 1939 and six years later blast the sounds of victory into Australian lounge rooms. Of course there were many other significant events: the launch of the first Holden motor car, the 1956 Olympics, the moon landings and explorations. Knowing that many of the radios I own would have been turned on in these moments in history makes the nation's collections even more significant. This is not to say that I object to replicas - I don't. Whilst preferring to collect genuine radios I simply recognise that collecting and restoring radios and then displaying them may well not be for everyone. Therefore I think that replicas definitely have their place, providing they are never marketed by people as anything but. One thing remains however and that is that I believe that replicas have no historical value at all.